The Movie Mind already gave Steve Carell a mulligan for Evan Almighty, and unless I’m playing Bill Clinton-golf, there are only so many I can hand out. Carell takes his turn at the schticky spy-comedy in hopes of an early summer blockbuster. Being the huge Carell fan that I am, it hurts me to call this one about a “four-laugher” and ultimately destined to become a dud. It’s as if Brick Tamland (Carell’s dimwitted character in Anchorman) was stretched out into a 2-hour feature where he may be slightly smarter, but much less funny. 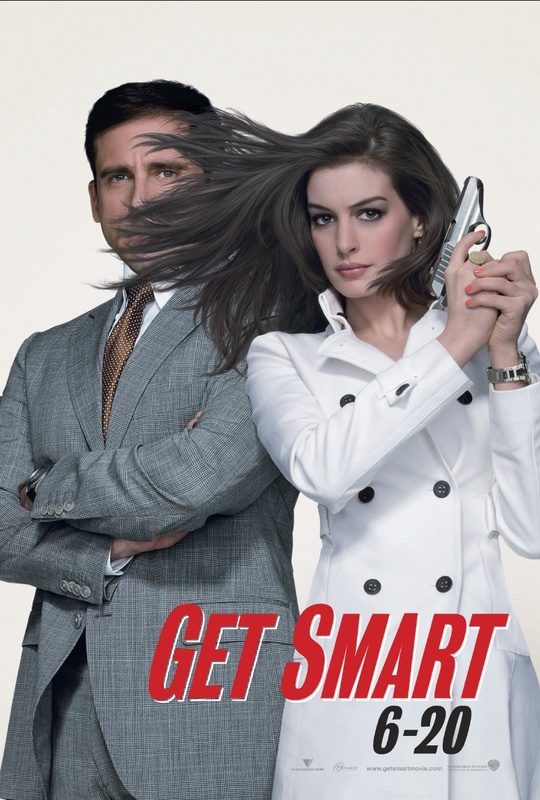 In this adaptation of the 1960’s television show under the same name, Get Smart hopes to thrust another generation into the old spy-caper genre by featuring Carell as the lead man. In case my readers need some reminding, The Movie Mind does not care how true-to-form this was to the original TV series. I wasn’t even a twinkle in my parents’ eyes in the 60’s so why do I care about that show in the first place? I only care about the comedic value of this edition. While Steve Carell crosses over into different generations, appealing to both baby-boomers and Gen-Y/Gen-X viewers, this film may only show any traction from those who remember the TV show. Carell is Maxwell Smart (aka Agent 86), a book-smart analyst for the CONTROL agency, supposedly more top-secret than the CIA. His lifetime goal is to become a revered field-agent, only he hasn’t the street-sense to accomplish it. He is more knowledgeable than any other analyst and because of that, he is a better asset to the team in the office, instead of in the field. The Rock plays the suave uber-spy that Smart so badly wishes to become. Smart appears to be relegated to the nerdery for the rest of his career until arch-nemesis spy group KAOS terrorizes CONTROL’s office and gains the identity of all of their current agents. This creates the perfect void for Smart to step in as Agent 99’s (Hathaway) new partner, whose identity was not revealed thanks to her timely facial reconstruction surgery. The two play on the sexual tension which appears to be only a one-way street at first, until Carell’s magical loveable dorkiness kicks into overdrive on Hathaway. Carell is like a hero to dorky single guys everywhere by giving them hope and changing the face of the leading man. Their goal to thwart KAOS is a mere byproduct of putting the characters in quirky situations in order to thrust Carell’s comedy routine in the forefront. I’m not sure if he was trying to stay true to the original Max Smart character, but Carell’s robotic delivery of the lines and monotonous tone takes away every quality that makes him funny in the first place. I thought this film missed in so many ways it is hard to narrow it down. There are definitely a few laughers but could have been so much more if they let Carell have free reign. It seemed like director Jason Segal was more concerned to staying true to a half-century old TV series than creating a great film. It felt a lot like Austin Powers without the clever dialogue and Mike Meyers charm, or even Mission: Impossible without the action and creative storyline. Give Carell a role where he can flourish like he did in The 40-Year Old Virgin and still does in The Office. The role, not the actor, was what failed so terribly here. It missed by a lot more than just “that much”. Interesting Cameo Appearance: A virtual cornucopia of random cameos ranging from former Denver Broncos linebacker Bill Romanowski, as a United States Air Marshall, to John Farley, younger sibling of Chris Farley, as Agent 38…and even Bill Murray as Agent 13 who has a random appearance inside a tree for 10 seconds. Throw in James Caan as our dimwitted President and Patrick Warburton (aka David Puddy from Seinfeld) as Hymie and you have built a JFK-like pedigree! Maxwell Smart: Missed it by that much. Siegfried: How do I know you’re not from CONTROL? Maxwell Smart: If I were from CONTROL, you’d already be dead. Siegfried: If you were from CONTROL, YOU’D already be dead. Maxwell Smart: Neither of us is dead, so I’m obviously not from CONTROL. Maxwell Smart: I request a cone of silence. Maxwell Smart: Oh, I’m so happy! I’m so happy! This is the best day of my life!